I Planned to make vadai but I'm running out onion. So i thought what can be replaced with onion.Long before i book marked this Cabbage Vadai here and have big size of cabbage sitting in my fridge. 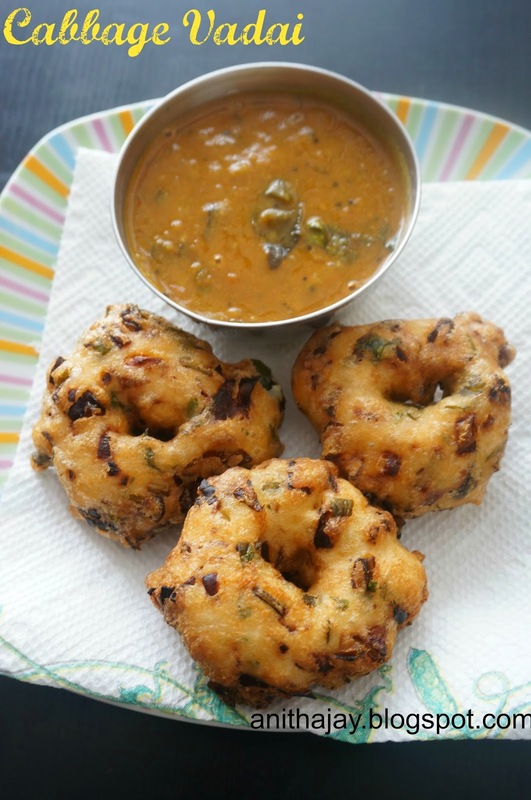 Without second thought i started preparing this healthy vadai. Wash and soak Urad dal for 3-4 hours. Drain the water and grind it with little water as a thick paste. Add all the ingredients to this and mix well. Heat oil in frying pan.When oil is hot wet your hand , take some amount of batter make a small and made a hole in middle using thumb and drop it into oil. Fry on the both the sides until slightly brown. Serve it with chutney , Sambar or with Tea/Coffee.